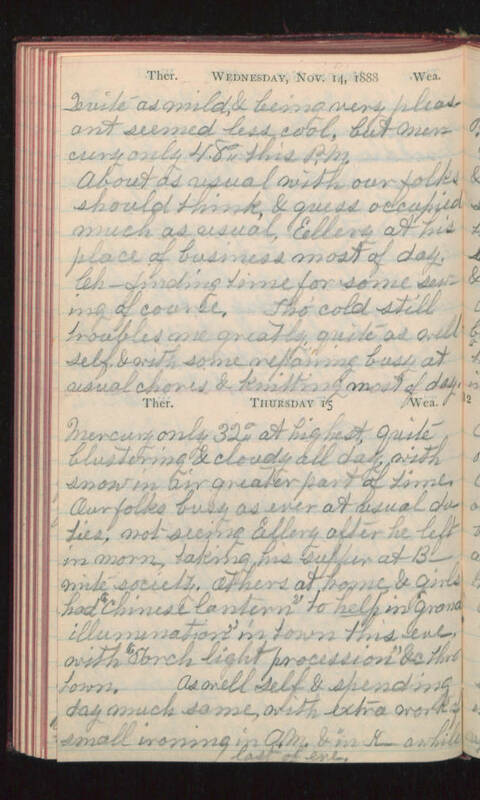 Wednesday, Nov. 14, 1888 Quite as mild, & being very pleasant seemed less cool, but Mercury only 48° this P.M. About as usual with our folks should think, & guess occupied much as usual, Ellery at his place of business most of day. Ch- finding time for some sewing of course. Tho' cold still troubles me greatly quite as well self & with some repairing busy at usual chores & knitting most of day. Thursday 15 Mercury only 32° at highest, quite blustering & cloudy all day, with snow in air greater part of time. Our folks busy as ever at usual duties, not seeing Ellery after he left in morn, taking his supper at B- Mite society. Others at home, & girls had "Chinese lantern" to help in "grand illumination" in town this eve, with "Torch light procession" &c thru town. As well self & spending day much same, with extra work of small ironing in A.M. & in K- awhile last of eve.